It's a really good game. Still on early access, with just 2 classes, but each of the 2 already has different strategies you can try to follow. For example, I have never been able to complete a run with the Silent class by using a poison-based deck (which is the favored approach by many people), but I just completed a run with a "play a lot of cards each turn" deck, and no poison at all. In a shop I found and bought the Panache card which deals 10 damage to all enemies each 5th card I play, and it was perfect for the job. Its an early access game in name but honestly it's solidly playable right now. Like if the developers suddenly all died this would still be worth a good 15+ hours of fun entertainment as is. None of the "this game is bad right now we'll promise tons of features and never complete them" that a lot of early access games fall into. Just had a run on ascension 2 as the silent, this badly bloated deck (over 30 cards) which had shivs / after image but no draw, catalyst with only 2 sources of poison, three blurs that were supported by a ragged cast of defences. I took philosopher's stone instead of sozu on the first boss, then took the white beast at second boss so I was actually using potions instead of ignoring them. Got the awakened one as my third boss, survived the dark echo, then died to a low damage attack after my blur ran out when it was half dead. I don't like paying to remove cards from my decks, so I rarely make consistent decks. I won twice with 30+ card decks yesterday; my silent had infinite blades and a dead branch, so I was also adding more random cards to my deck every turn. I swear some decks should refuse dead branch. But I had lots of good powers to hold the jank together. My other was a strength ironclad that was just undisciplined, taking lots of sword boomerang type cards and then wondering why it took me five turns to draw demon form sometimes. It had jewelled choker so I didn't have any draw to help make it more consistent, but I'd been making a point of fighting elites so I had a huge row of relics that made the deck better. they gotta make more than one more class. Of course this is just personal taste, but in my opinion, graphics are not bad, they have that "hand-made" feeling. I'd take this style over pixel art anytime. and it has no guns, so it's probably supposed to shoot only lasers, maybe from the eyes. 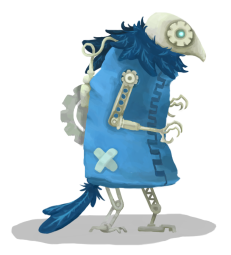 I think the devs have stated that a lot of the crowbot stuff is just old ideas and won't actually be a part of the third class. Maybe they're just lying though, who knows. I'm not totally disappointed. I hope they save the gunslinger idea and make a human one rather than a mechanical one, with cowboy hat, guns, and all the classic western stereotypes. On a different note, I just completed a "Snecko Eye-powered" Ironclad run. The funny thing is I got offered 5 Bludgeon throughout the run, but I got Snecko Eye only after the 4th was offered and until then I didn't want more than 1, so I ended up with 2, plus a Searing Blow +5 which was even better than Bludgeon. Snecko Eye is a relic that lets you draw 2 additional cards each turn, but in exchange it gives you the Confused status which randomizes the cost of all the cards you draw between 0 and 3. You are of course incentivized to get a lot of expensive cards so that Snecko Eye can make them cheaper. Bludgeon is a card that costs 3 energy and deals 32 damage (42 when upgraded). Searing Blow is the only card in the game that can be upgraded multiple times. It costs 2 and it just deals damage. Can't remember how much damage it does with no upgrades, but it becomes interesting only after the 2nd-3rd upgrade. After 120+ hours, I finally got an infinite combo deck, when I wasn't even going for one initially. I used the combo against all three bosses and against the Maw on the third act. I got an early Fiend Fire and a Dropkick, bought a Finesse from a shop just in case, then got some Burning Pacts and True Grits, thinned my deck down to six cards during the boss fight and recurred Dropkick and Finesse over and over. My deck still grew to 36 cards by the end but with lots of draw and alternate combo pieces / useful tools, like I used Dual Wield on my Fiend Fire to help me thin it down faster, and I had Brutality with Runic Cube so I was drawing seven every turn. They finally added the 3rd character in the beta build. There are still many cards with no proper illustration and they get frequent balance changes, but it's nice to be able to play it already. It's a robot, but totally different from the concept I found in the old files, and it has a unique mechanic: orbs. You can channel an orb, meaning it's added to your active orbs and (usually) has a passive effect, or evoke an orb, meaning it's consumed for an immediate and (usually) more powerful effect than the passive one. If you channel an orb and you have no room for it, the oldest orb is automatically evoked. There are cards that extend your orb capacity, and cards that give you Focus, which strengthens the passive effects. I find this new mechanic really fascinating, because it adds a new layer of strategy: which kind of orbs do I care about the most? Do I keep the orb for its passive effect or do I consume it? there's a relatively active modding community you could check out if you wanted to wet your appetite, either looking at what other people have done or doing something yourself. Most of the fan-characters i played felt pretty shabby but a lot of them were pretty cool feeling as well. The game reminds me heavily of a game i was super into a while ago called "deck de dungeon" which was i think originally japanese and had a really bad translation and seemed pretty unpolished in general so i wasn't ever fully aware of what was going on. Both are essentially dungeon crawler/deck builder hybrids. Deck's characters were probably more interesting, and the shared card pool was larger (the difference between characters was generally the starting deck rather than the available card pool). Deck also had a bigger emphasis on degenerate combos and on permanently adding/removing cards from your deck, the end-result being that it felt a lot more like dominion to me. Despite sinking hundreds of hours into deck, I also never beat the default mode. Certainly I'd like a fresher variety of characters though. Isaac (which i like to compare this game to) and Deck both had a really wide variety of characters that supported a lot of pretty different playstyles. Right now all three characters have different archetypes, but all the archetypes end up feeling pretty similar, and the differences in playstyle between the characters feels relatively small. They will probably end up releasing more content, including characters, as paid DLC. They've not officially stated that they would do so, but that's the thing that just... well logically makes sense. It's much easier to sell new content for an already developed game than it is to make a second major hit. They have stated that they plan for the 3rd mode to be an Endless Mode. I'm not sure how much difficulty scaling that will entail if any but i would expect it to be more punishing than just beating the game. They have also stated that they plan for the Heart to just be a placeholder for an actual ending. I'm not sure what they are going to do but they are going to try to let you "Beat the Game" in some fashion at some point here. I'm hoping the achievements they add when the Defect enters the game aren't too hard. I've gotten all the ones currently in the game, and I feel somewhat compelled to do whatever stupid thing ("Ooh Donut!" being the best example of a really stupid achievement) each one asks of me to keep the list at 100%. If they ask us to beat Ascension 15 on all 3 characters I'm going to cry a little, so I'm hoping it's mostly just Defect related stuff (do certain builds, win a game with the Defect, etc.). Currently I'm at Ascension 11 with Ironclad and Ascension 5 with Silent. That's just because I took a break to... have a life. I have spent 222 hours playing this game, which is too much if you aren't a streamer considering the short time span that all occurred in.